I have always wanted a chow, and have been waiting for my life to line up right so I could finally get one. Once I moved out of my parents, in with my boyfriend I batted my eyelashes and we mulled over the idea. He did not want a chow, fearful of their stubborn reputation, wanting a different breed. I spent at least 3 months reassuring my boyfriend that I could handle the puppy/chow. Once I got an official yes on the chow, I contacted the breeder I had been eyeballing for like 5 months to talk about getting a puppy. After a nice long talk, explaining what I would be doing in the future (dogtrainingrooming) We decided on a cinnamon pup from her most mellow breeding pair. The longest two weeks of my life waiting for 8 weeks! We got him home, and I was honestly so puzzled by him. He was so quiet and well....reserved. Its been a few days now, he's opened up much more! 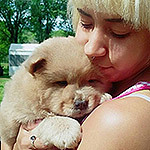 Welcome Buki and Louie to the Chow Chow Fan Club!! Chows have such unique personalties-a mix of dog/cat features, plus they always surprise you because you really can't compare them to other dog breeds. People will be drawn to him and will give him lots of love when they see him. He sounds and looks great, and wish you years of happiness together. Chow pups can go from reserved to full on in charge in an instant. When our now 5 year old male 1st arrived at our house, he hesitated to come out of the travel crate (short car ride home, no plane trip or other involved). He sat in one spot on the living room floor for hours and barely moved. We had a similar experience to you as we went to the breeder and met the whole litter. Rory was picked as he had an immediate bond with my wife. Wait a few weeks for whelping to be done and litter socialization, etc, and we brought him home. Wife and daughter were concerned that he wasn't interested in them, playing with the $$$$ of toys we got for him, or the treats they offered. We left the travel carrier in that same spot and left him to get accustomed to his new home. It took a while, he started to venture to the food bowl, and checked out the toys, but always returned to that spot. After a few days he switched. He used that spot as his starting point but started to run laps around the room (wrecklessly I might add). He tossed toys in the air, and chewed the socks right off the girls. He demanded attention and rightfully so, got it. So we moved on to puppy training and socialization. To this day, that singular spot in the living room is his go to place. He will still choose that space to lie down and rest. We have 2 other Chows in the house now, and that is still his, but has added a nice spot outside in the driveway, close to the transport van as his second favorite place. He is well travelled and knows when the crates go in the truck it's road trip time. He knows a trip to the groomers always means a show trip follows the next day. He knows when I cook chicken before 6pm at night that I am making bait for the weekend. And his personality jumps a few steps. I swear he starts smiling. So, give yours a little time to get acclimated. It's not always easy leaving your parents and litter mates to head off to a new home. It's an adjustment. Make sure it's a positive experience, and give him a bit of time. Keep a structure that he will understand and get used to. Chows always have mellow face. Adorable! Sounds like our little guy! This is our first Chow, so in love with this guy!!!! He has been the best pup.